BNP is now under fresh pressure as its top leaders are facing Anti-Corruption Commission (ACC) probe, party insiders said. Making the situation even worse, BNP’s partners in the 20-party coalition are exerting pressure on it to finalise seat-sharing immediately for the next general election. After two months of party chairperson Khaleda Zia’s imprisonment in a graft case, BNP leaders are facing a number of challenges such as maintaining unity in the party and the alliance, carrying on movement demanding Khaleda’s release, keeping morale of the party leaders and activists, winning the city corporation elections and ensuring the next parliamentary elections under a non-party government, the sources added. Talking to the daily sun, some BNP leaders said their party men are still uncertain about the release of Khaleda Zia before the next general election, participation in the 11th parliament election, party’s future and its leadership if Khaleda Zia remains in jail for a long period and senior cice-chairman Tarique Rahman continues to stay in London during the national polls. In the circumstances, some BNP leader said, the party is facing a new problem as ACC has recently taken a move to investigate allegations of money laundering and amassing wealth illegally against eight top BNP leaders. It (ACC) has also sought bank account statements of the BNP leaders from seven different banks, they added. BNP standing committee members Khandakar Mosharraf Hossain, Mirza Abbas, Nazrul Islam Khan and Amir Khosru Mahmud Chowdhury, Vice Chairmen Abdul Awal Mintoo and Morshed Khan, Joint Secretary General Habib-un-Nabi Khan Sohel and National Executive Committee Member Tabith Awal and Morshed Khan’s son Foysal Morshed are under being investigated. “It is a conspiracy against BNP. It is a part of plot to keep BNP chairperson Khaleda Zia and her party away from the next parliamentary elections. The people who are in government are hatching the conspiracy. We don’t feel any pressure for it,” Khandaker Mosharraf told the daily sun. BNP sources said the party leaders are also afraid as trial proceedings against some top leaders are going to end and a number of top leaders are likely to face trial and reinvestigation into graft cases against them following conviction of party chief Khaleda Zia. Khaleda Zia was sentenced to five years in jail in Zia Orphanage Trust graft case on February 8. Her son and BNP Acting Chairperson Tarique Rahman was also awarded 10-year imprisonment in the same case. 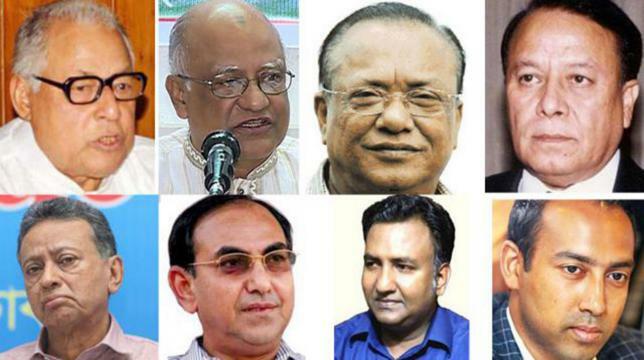 Trial proceedings against four BNP leaders - standing committee members Khandaker Mosharraf Hossain and Mirza Abbas, Vice-chairman Abdullah Al Noman and party chairperson’s adviser AKM Mosharraf Hossain - are set to enter the final stage in several cases. Talking to the daily sun, some top BNP leaders said some components of the 20-party alliance want to realise their demands when the BNP is in crisis due to the absence of its chief Khaleda Zia. “I think BNP will resolve the crisis through discussion with its allies,” BNP standing committee member Mahbubur Rahman told the daily sun. Speaking at council session of Dhaka North City Unit of Liberal Democratic Party (LDP), a component of the 20-party alliance, Shahadat Hossain Selim, the party’s senior joint secretary general, said BNP should resolve the seat sharing by this April. “If this problem is not solved by April, we will think that BNP is reluctant to do it. If BNP makes the list of 900 probable candidates for 300 seats then LDP has also ability to make list of 600 possible candidates for the national polls,” he said. Addressing the programme, LDP secretary general Redwan Ahmed, Kolyan Party president Syed Muhammad Ibrahim and Bangladesh NAP secretary general Golam Mostafa Bhuiyan also expressed resentment towards the BNP over various issues. Twenty-party alliance coordinator Nazrul Islam Khan, also BNP standing committee member, on Friday night held an urgent meeting with top leaders of the coalition and discussed the matter.